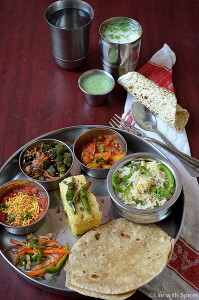 Gujarati Thali the entire meal can be prepared in less than hour. Choice of veggies are completely left to availability. It has become customary to cook mini thali / meals on weekends. On weekdays lunch is packed food which is cooked in the morning and eaten in a hurry by hubby. So i plan a small spread on weekends either a mini North Indian / South Indian thali. Not much of elaborate preparations are done to cook such simple food at home. Combine all except fruit salt in a bowl, mix well by adding water and make into thick batter. Grease a tray and keep it ready and prepare the steamer. Just before steaming add fruit salt to the batter, mix well pour on they tray and steam for 12 to 15 minutes or until the knife comes out clean. Heat a small pan add mustard seeds, once it crackles add hing, cumin, sesame once it cracks add green chillies, curry leaves saute well and switch off the heat. Pour 2 tbsp water, 1 tsp sugar mix well and pour the tadka over th dhokla. Cut them and serve with green chutney. Heat oil in a pan, add cumin seeds, hing once it cracks add tomatoes, turmeric powder, coriander powder, red chilli powder, sugar, salt mix well and cook in simmer until tomatoes soften. Remove from heat add sev, mix it and serve immediately. Heat one tbsp oil in a pan add cumin seeds, once it crackles add onions, ginger paste and cook till it softens, and remove and set aside in a plate. Add another tbsp of oil add bhindi and cook in medium heat until they turn crispy. Add the sauted onions, red chilli powder, coriander powder, salt to the bhindi mixture and cook in medium heat for 5 mins covered remove from heat and serve hot. Combine all the ingredients in a deep bowl and knead to soft dough by adding water. Divide the dough equally and roll them thin, heat a tawa place rotli on it cook on both sides. Remove from tawa and allow to fluff up on open medium flame, remove and smear ghee over it and serve hot. Heat ghee in a pan add bay leaf, clove, cardamom saute well, add green chillies, onion, ginger garlic paste, saute until the raw smell leaves. Add mint, coriander leaves mix well, bell peppers, salt and give a nice stir add rice, 3/4 cup water mix well and pressure cook for one whistle, slow the heat for 5 minutes after which switch off the heat. Once heat down remove the lid add paneer cubes, sprinkle coriander and serve hot. Mix all the ingredients and serve. Mix all well and serve chilled.